We are amongst the most reputed names in the industry, offering Wooden Hand Made African Mask. 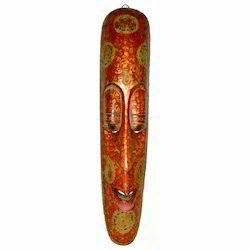 Fine Decorative Wooden Painted African Mask Available In Different Designs & Sizes. Our reputed entity is engaged in supplying African masks. In order to meet excellent quality standards, we are supplying African Tribal Masks Drawings. Banking on our enriched industry experience, we are able to supply Teracotta African Tribal Mask. The Yaure, a small ethnic group inhabiting the Central Regions of the Ivory Coast. Their masks, whose features include human and animal attributes, belong to either the Je or Lo Societies.Painted masks are are considered emblems of supernatural powers known as the Yu. Believed to be extremely dangerous and handled with great caution. Absolutely kept out of the sight of women. We are amongst the most reputed names in the industry, offering African Mask. We offer a hand made Costume African Mask, with a latest costume designs. base on human figures, it reflects the human salvation & dignity. 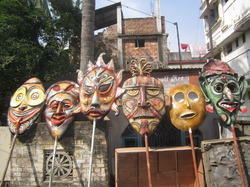 Costume Masks made with solid paper craft, with a chocolate color complexion. A little base design on upper case of human forehead position. Fantastic looks as costume make ups, with a intelligence creativity. A new brand in mask market.